ASUS’s entire Z87 motherboards lineup has been unveiled by our friends at EgyptHardware. 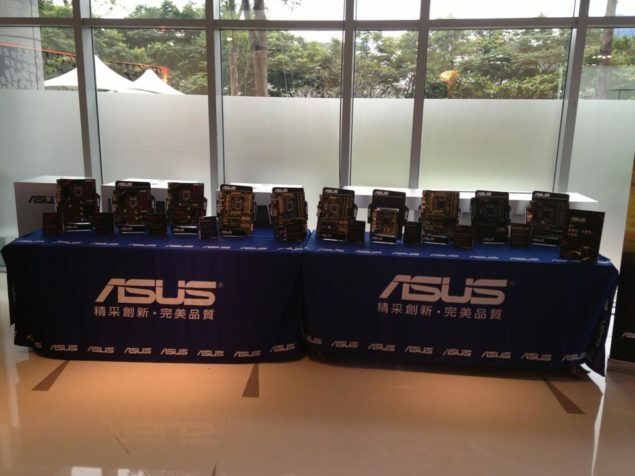 A few months ago, ASUS teased a few pictures of their upcoming motherboards such as the Gryphoon Z87 and Z87 Deluxe mobos but today we have full pictures of their entire Z87 motherboards lineup. 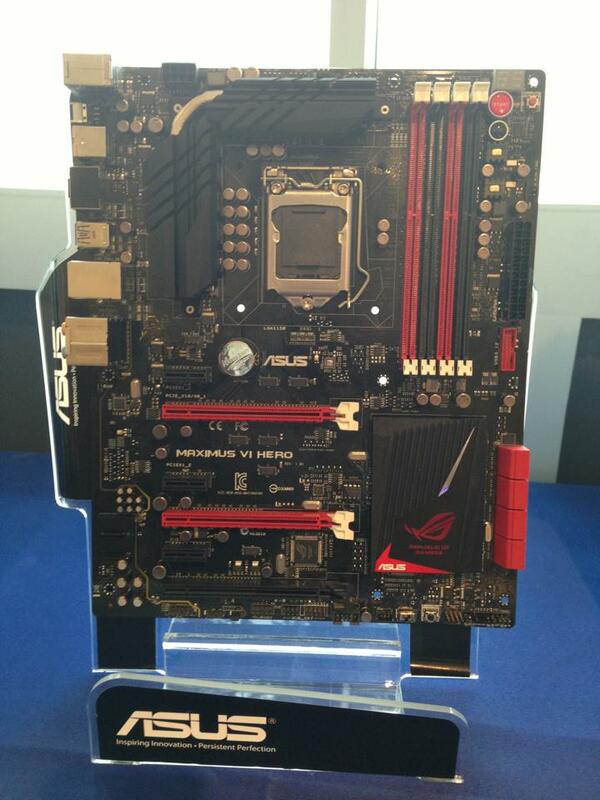 The ASUS Maximus VI Extreme comes with the red and black theme design and the latest LGA 1150 socket to support the upcoming Haswell processors.The CPU is powered by 8+4 Pin connectors while an additional six pin connector provides extra power to PCI-e GPUs. Expansion slots include five PCI-e 3.0 x16 and a PCIe 3.0 x4 slot, also an mPCIe combo slot is located near the I/O panel on the motherboard. A total of 10 SATA 3 ports offer storage, a large heatsink covers the nearby Lynx point PCH and the board has several overclocking options near the DDR3 DIMM slots such as Voltage measurement points, On/Off and Clear CMOS swtiches. The Maximus VI Hero is a cut down version of the Extreme featuring a similar design but only three PCI-e 3.0 x16 slot and three PCI-e 3.0 x1 slots. For storage there’s 8 SATA 3 ports while the CPU is powered through a single 8-Pin connector. Overclocking features remain the same but the CPU nor the PCI-e GPUs are provided extra power to additional ports. There is however an addition of several I/O ports but we don’t know what features the have. 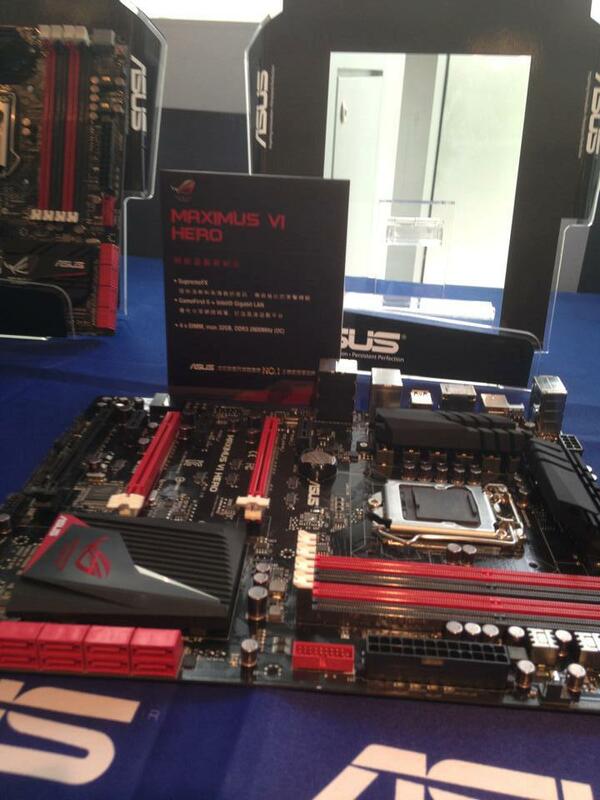 Next up is the Maximus VI GeneZ which is the M-ATX board made for overclockers. It maybe small but it retains the overclocking features of the flagship Extreme motherboard, comes with two PCI-e 3.0 x16 and a PCI-e 3.0 x4 slot while storage includes 8 SATA 3 Ports. There are several I/O options an the addition of THX audio within the backpanel ports. 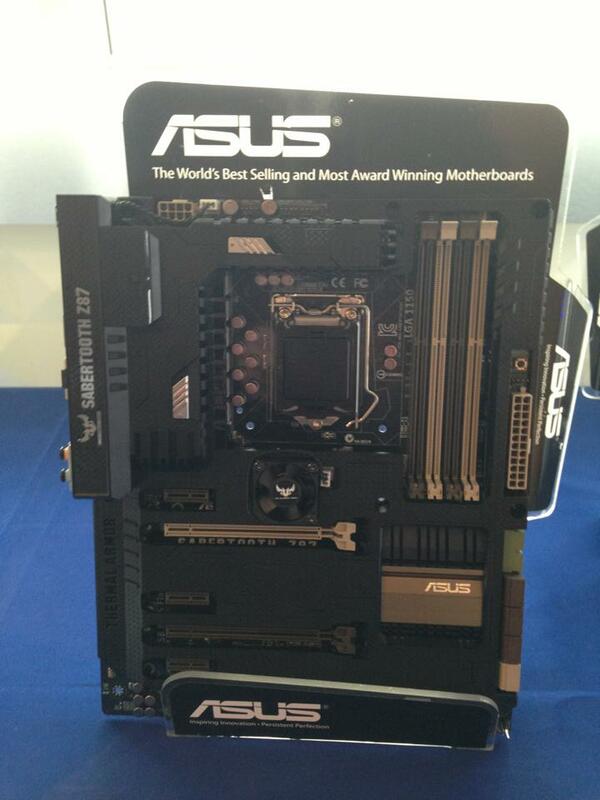 ASUS Z87 motherboards lineup would also include the monster Z87 Sabertooth packed inside its TUF third generation thermal armor. The TUF Thermal heatsink makes use of air cooling through a single fan that pushed cool air to the internal electrical components.Expansion slots include two PCI-e 3.0 x16 and three PCI-e 3.0 x1 slots while storage include 6 SATA 3 and 2 SATA 3 GB/s ports. 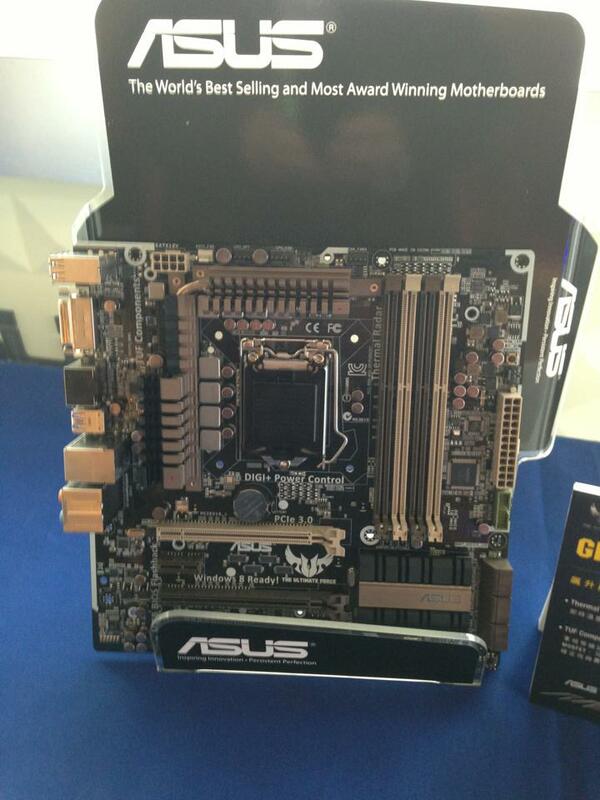 The motherboard retains its Sabertooth color theme for the PCH and overall heatsink design. 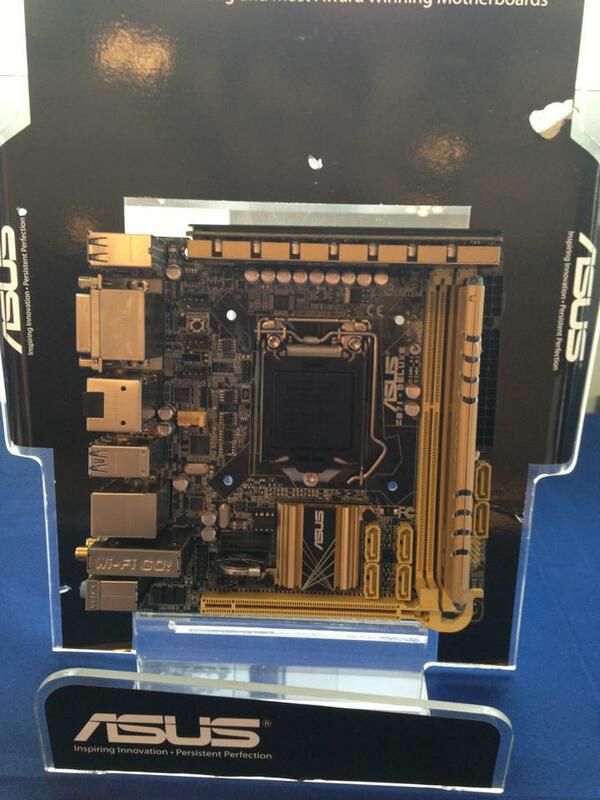 Coming to the Z87 Gryphon, the motherboard that was teased months back is also a M-ATX board that makes use of socket LGA 1150 and retains a design theme similar to its bigger brother aka the Z87 Sabertooth. The Z87 Gryphon features an 8 Phase VRM, two PCI-e 3.0 x16 slots, two PCI-e 3.0 x1 slots, 6 SATA 3 ports for storage and features such as TUF components and TUF Thermal radar to ensure the best stability. 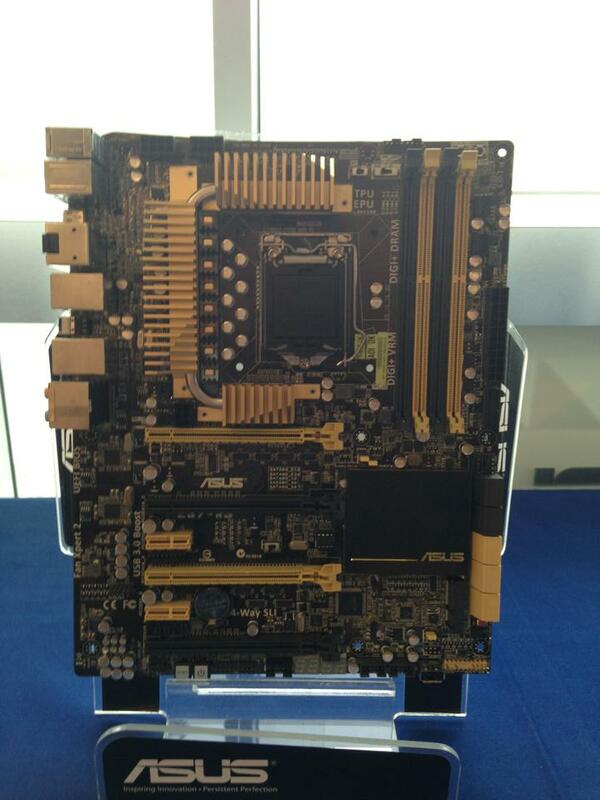 Next up we have the standard ASUS Z87 motherboards lineup which aren’t a slouch either. 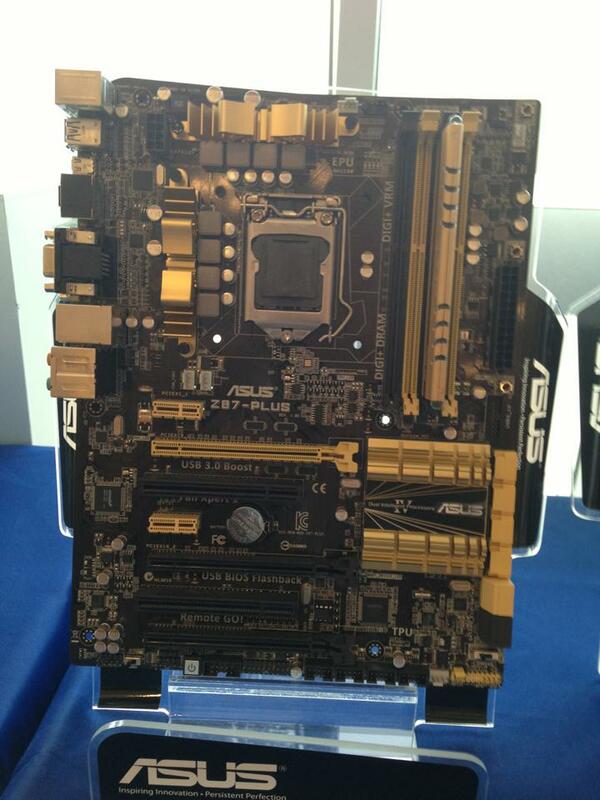 The flagship of this series is ASUS’s Z87 Deluxe Pro that makes use of the fourth generation DIGI+ engine. 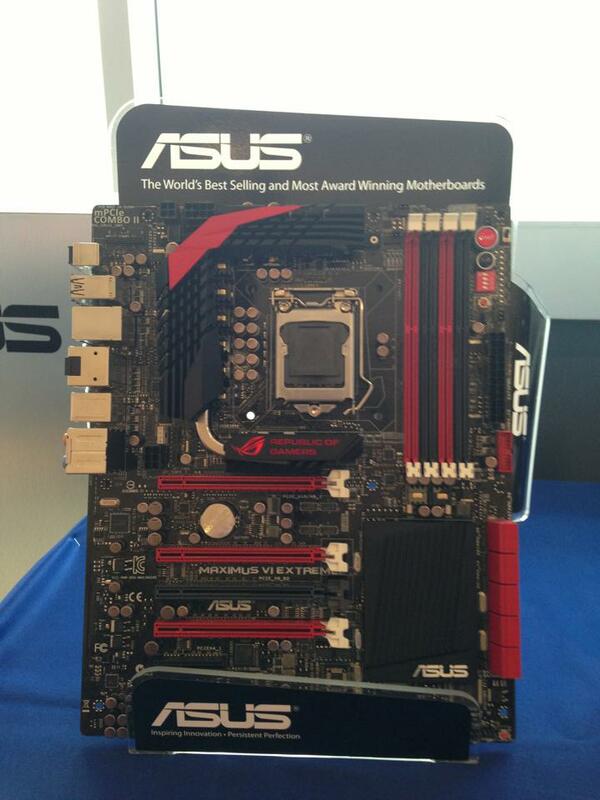 The LGA 1150 socket is powered by dual 8 Pin connectors making it the most enthusiast minded board in ASUS’s lineup. The feature rich motherboard comes loaded with alot of components such as EPU, DIGI+ VRM, DIGI+ DRAM and WiFi 802.11 onboard. 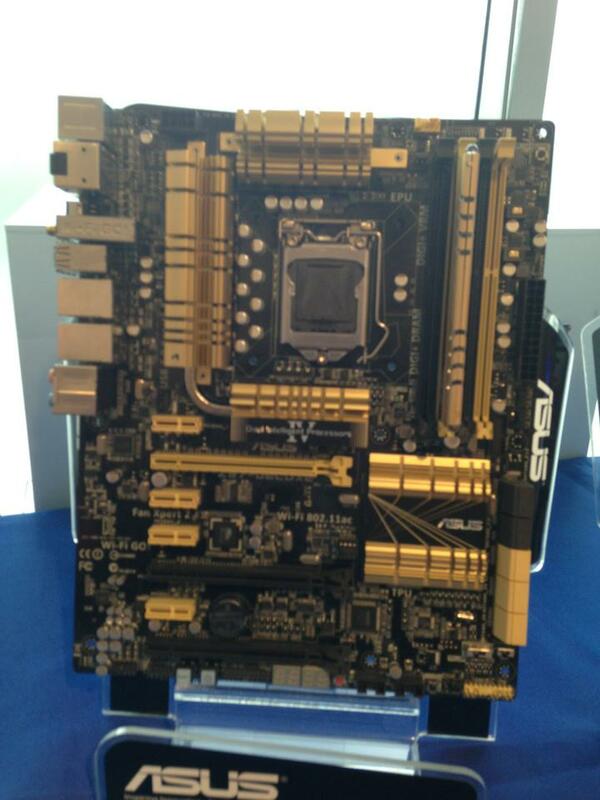 It comes with three PCI-e 3.0 x16 and four PCI-e 3.0 x1 slots, 10 SATA 6GB/s ports for storage and a golden/black design scheme which is something new from ASUS. The rest of the lineup which includes the Z87 Pro and Z87 Deluxe also use the same set of features with a few components missing here and there to make a cost effective product. 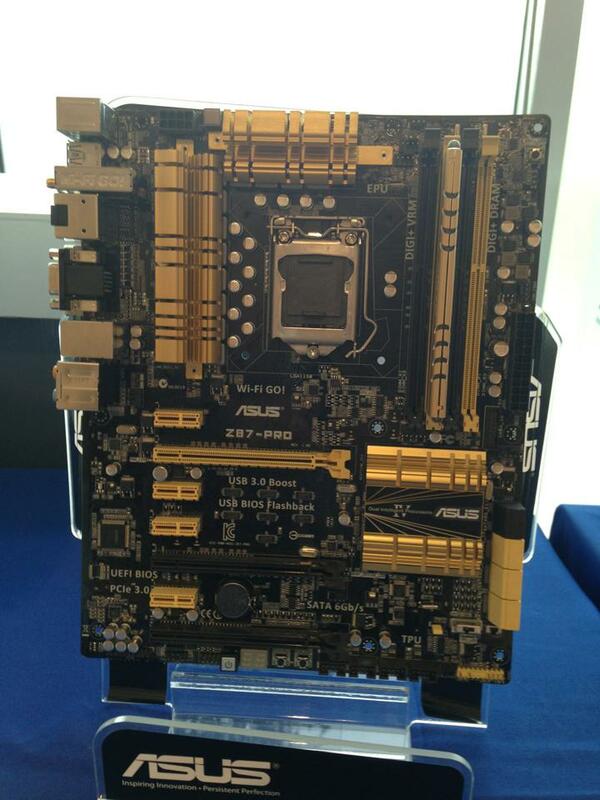 The most interesting product in the ASUS Z87 motherboards lineup is their Z87i-Deluxe which is a M-ITX board that makes use of an VRM board similar to the P8Z77i-Deluxe that packs 10 VRM phases. It comes with 6 SATA ports, a PCI-e 3.0 x16 slot, two DDR3 DIMM slots and several ports on the I/O backpanel. 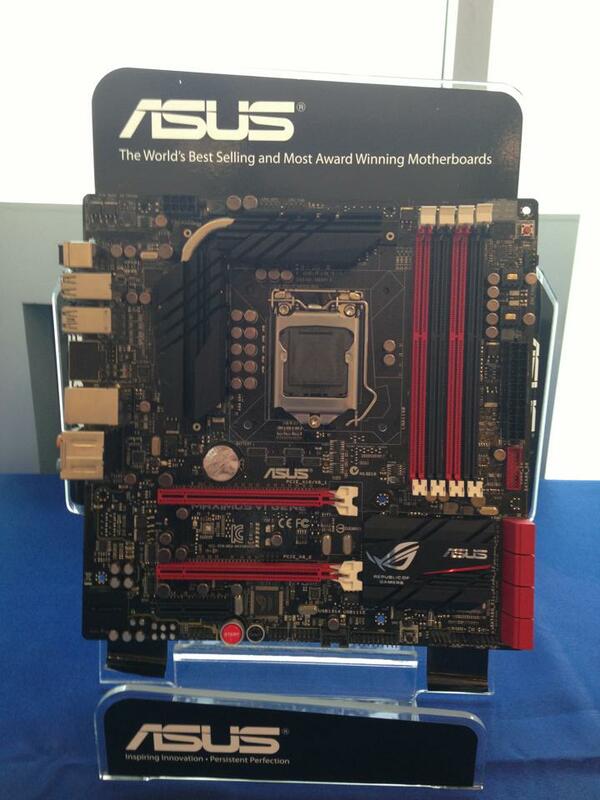 Pricing for the ASUS Z87 motherboards were not mentioned but their launch is expected on June 3rd.